today's woman: I had a nice holiday. I must say I had a nice holiday. I ate some good foods, sat around like a loaf of bread and received some nice presents. I had a nice time I must say. Everything I have done in the past few days has been about consuming and so then naturally I found one more thing that I would like. 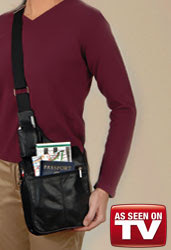 I saw this wonderful infomercial about the Buxton Over the Shoulder bag. In the new year I would like to be more organized and this Buxton bag could help with that. You can fit everything in the bag in an organized manner. Oh the magic of organization. I was on the gchat with my pal Glennis McMurray and showed her the glory of the Buxton Bag and she noticed that there was something fishy with lady on the website. She was correct! Look, the woman head picture was taken separately from the woman body picture! I still would like a Buxton bag even with the unattached head and all. I'd like a Tan one, thank you. I would wear it with my purple fanny pack. I hope you received a nice outfit for Christmas.